Sep. 12, 2017 3:20 p.m.
One of the Sopwith Pup airplane replicas needed some help after a mishap Tuesday afternoon at the Langley Regional Airport. “The pilot wasn’t hurt at all,” said Dave Arnold, general manager of the Canadian Museum of Flight, which built and owns the aircraft. 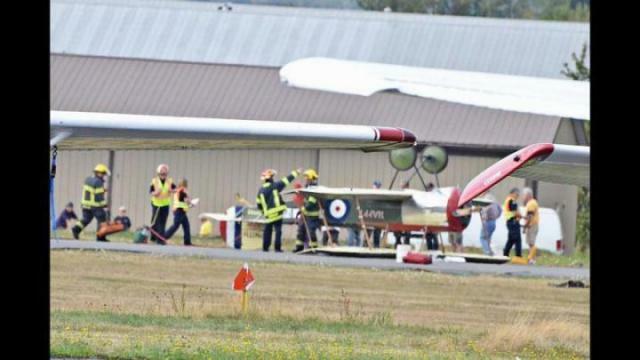 Fire crews, the RCMP and paramedics were dispatched to the runway where the Sopwith named Happy was on its top. The aircraft was landing after a normal flight, when the pilot said that it felt like the brakes were not releasing properly, said Arnold. Since the brakes are only on the front wheels, that meant the back end tipped up. “The tail slowly went up and he went over,” said Arnold. The incident took place at low speed. It’s been reported to the Transportation Safety Board of Canada as a minor damage accident. The incident is considered minor because no one was injured and the damage to the plane is moderate. “The pilot, who was the sole person aboard, was not injured,” Krepski said. The TSB has gathered the necessary information from those involved. The TSB looks at an incident, the severity, the number of people involved and other factors in determining which warrant an in-person response and the extent of investigation. The propeller will have to be replaced, and the entire aircraft will need a thorough inspection, Arnold said. “As accidents go, this was pretty minor,” he said. The Pups were expected to head overseas to Vimy Ridge for a flypast in April this year. They did get shipped over to France, but were unable to fly in the Vimy ceremonies because the existing engines didn’t have enough recorded flight time. Instead they were put on display on the ground. The Canadian Museum of Flight has been around since 1977, first operated out of a barn in Crescent Beach before being moved to the Langley airport in 1996.